We don’t need a Trump-nominated supreme Court justice. We desperately don’t need such a person. And there is no reason to have one. The Democrats in the Senate should just filibuster any nomination for the next four years. Now, you may say that a president deserves to have the nominee of his choice voted on. But those were the old rules before we saw how the Republican Party treated Barack Obama. They just told him no, no, no on everything. Everything. They even threatened the home mortgages of government employees by closing down the government. Twice. They vilified Obama, shouted disrespectfully at him from the floor of Congress, and then they refused even to let his Supreme Court nominee, a centrist, come up for a vote. They declared President Obama a lame duck when he had 11 months left in his presidency. 1. Republicans did not let Merrick Garland come up for a vote. Why should Democrats allow someone else to? 2. Republicans declared Barack Obama a lame duck beginning in February of 2016, when he had 11 months in office. I declare Donald Trump a lame duck, four years out. 11 months, 48 months– what’s the difference among friends? If presidents aren’t really presidents for 23% of their terms, why not make it an even 100%? After all, the next election isn’t far away. The American people deserve to be heard on this issue, and the results of this election were too confused to allow them to be heard decisively. We can just wait till 2020, the way the GOP wanted us to wait till Obama was out of office to do anything at all. 3. Nearly 3 million more Americans voted for Hillary Clinton than for Trump, even with substantial voter suppression in states like North Carolina. They did so because they cared about women’s reproductive rights, labor rights, the environment, civil liberties, and other issues decided by the Supreme Court. It would be an extreme insult to popular sovereignty to thwart their voices, the majority of the country, and have a minority president appoint some far right patriarchal demagogue to injure their constitutional rights. 4. The issue transcends ideology. Many of Trump’s appointees have been loony as the day is long. His national security adviser, Mike Flynn, thinks that Hillary Clinton secretly practices voodoo and he just met with the head of a far right party founded by ex-Nazis in Austria. The Supreme Court interprets the constitution for our country and we can’t afford Trump’s affirmative action for the Tinfoil Hat Brigade to extend into that august body. 5. 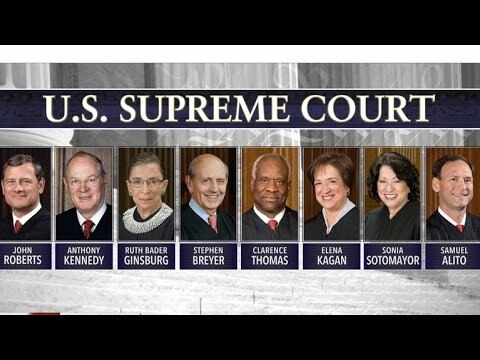 The 8-person Supreme Court we now have is just fine. They don’t need another colleague. Without Antonin Scalia, they have been making reasonable decisions. Let them go on doing so. You might argue that they need to have an odd number of members so that ties can be broken. But, why? If they can’t decide a case because they’re deadlocked, it can just be returned to the district court it came from. Besides, maybe Clarence Thomas will retire and we can suffice with 7 justices. You might say that if the Dems act in this way, the Republicans will just change the Senate rules so that things are done by a simple majority. Let them. Sooner or later the Democrats will get a simple majority in the senate along with a Democratic president, and no one ever again will be able to constrain them the way the GOP put President Obama into a straight jacket. We’re watching you, Senate Democrats. Remember: No Trump appointee should be seated. Ever.